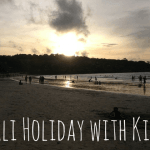 We’ve been having a great time in Indonesia so far, exploring Bali, the Gili Islands and Lombok. We were ready for some luxury by the beach though, somewhere we could relax and still have plenty to do. Enter Novotel Lombok Resort and Villas. 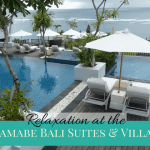 This resort is perfect for families with plenty of included activities, yummy food and plenty of facilities right by a beautiful beach just outside of Kuta Lombok. We had a fabulous time relaxing on the beach and in the pool, trying out many new things and just having a great time together. What I loved most about the Lombok Novotel is how it is set up to be perfect for those of us who want a resort holiday where they can relax and have no reason to leave the resort but also for those of us who want somewhere nice to stay where things are easy but also want to get out and about and explore and not be too isolated. The resort itself is beautiful with lush gardens and a gorgeous private beach. There are many facilities including three pools (including an infinity pool), a gym, a day spa, kids’ club, kids play area, water sports including a dive counter, day spa, salon and a shop. The best part for us, however, was the daily free activities. There are many things going on throughout the day which you can join in on from sunset tours to monkey feeding to visiting nearby beaches and markets. I loved the amount and variety and how easy this made it for us as a family. The kids loved trying all the different things and I love it when we have an easy way to expose them to new things. More about the activities below! We found it the perfect place to stay with a family – and there were many families there. It is a great deal for families as two kids under 16 have free accommodation and breakfast in their parent’s room and there is plenty to do for all ages. We found this a fabulous contrast to Bali where most hotels we looked at wanted to charge us 50% extra per kid with breakfast on top! 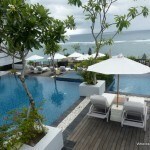 Novotel Lombok is located just outside the town of Kuta (not to be confused with Kuta in Bali!) on the southern coast of Lombok. 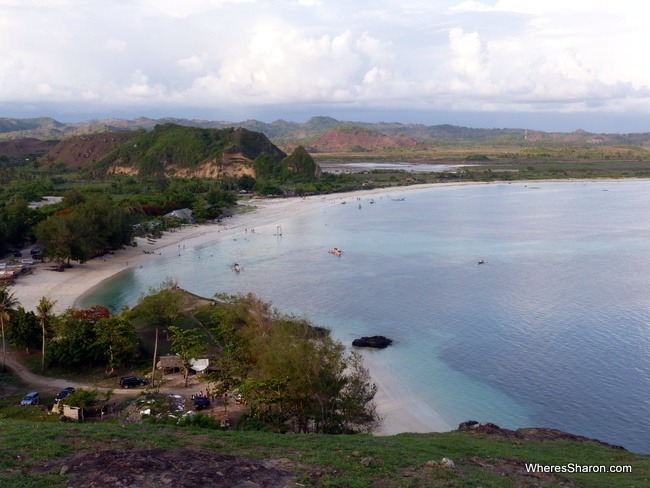 It’s close to Lombok’s airport and surrounded by beautiful beaches and scenery. Every day there’s a range of free activities, most of which happen inside the resort itself. I had a great time feeding the monkeys that live next to the resort as part of the monkey feeding excursion. Their tiny little money paws grab the peanuts right out of your hand! 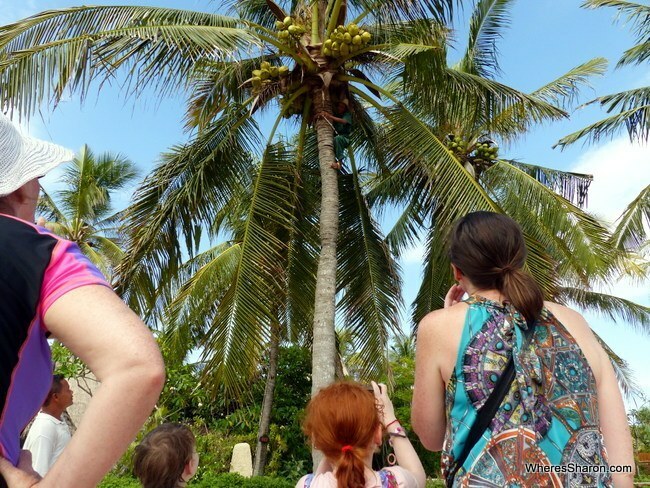 The kids enjoyed watching the coconut climbing demonstration (actually very interesting) and tasting a fresh coconut straight from the tree. There’s different things going on every day, from your typical water aerobics to petanque, plus horse feeding and rides on the hotel’s own cidomo. There’s a big range of free activities for a smaller resort, almost all are kid friendly. At the Spice Market restaurant there was nightly entertainment at dinner time most nights. On our first night the show was “Novotel’s Got Talent” which I feared was some daggy talent show but instead had some great cultural displays like stick fighting and plate dancing (sadly only one plate was broken). There were some opportunities for people to participate and S loved getting up and dancing. The kids are entranced by a West Sumatran “Plate” Dance at the Novotel’s Got Talent dinner show. There’s movies every night at the [email protected] area, starting when it gets dark enough – they started from 6pm when we were there. In addition, there’s the things you’d expect to have at a good quality resort, like a spa offering massages, a hair salon (offering hair masks and other treatments in addition to hair cuts) and a kids club. The kids club was simple but it kept S and Z entertained – perhaps too much as it was hard to keep them away! – and they loved playing on the play equipment there, especially with other kids. The kids enjoying the kids club’s play equipment. We tried out both the Sasak massage at the spa (traditional form of massage from Lombok) and hair treatments at the salon. We were very happy. They also offer pregnancy massage for people travelling pregnant like me. The free activities also cover things outside the resort. 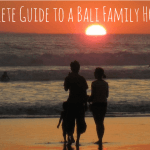 There’s tours of the nearby Kuta Markets and sunset tours to Bukit Merese at Tanjung Ann for stunning sunset views plus other excursions to places nearby. It’s also possible to book other tours, hire a driver or just get a lift into town. We did a half day tour to a nearby stunning beach (Selong Belanak), a lunch stop at a great lookout and a Sasak traditional village (more details to come in our detailed Lombok article!). It was very well organised and we were impressed when towels and lounge chairs appeared at the beach stop as well as cold water. 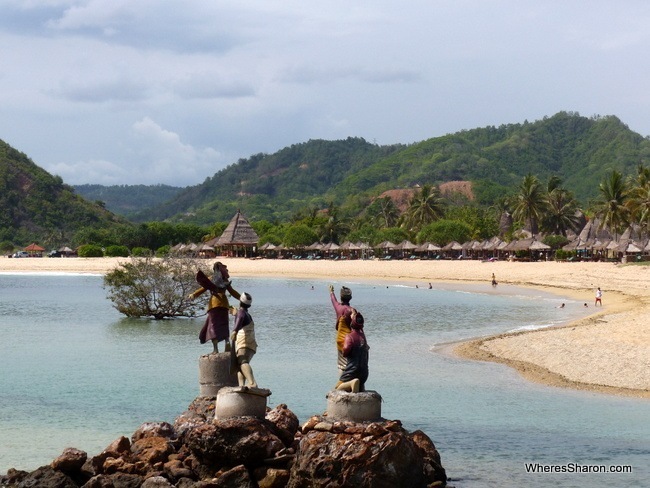 It is definitely worth seeing more of Lombok while you are the Novotel. It’s a stunning area. We stayed in a superior room with a king bed. What is great about this room, especially for families, is that it comes with a day bed which is basically a single bed. Our kids were able to sleep on there. The room was a good size with lots of storage space. There were two desk areas in our room which was great when both of us needed to do some work. 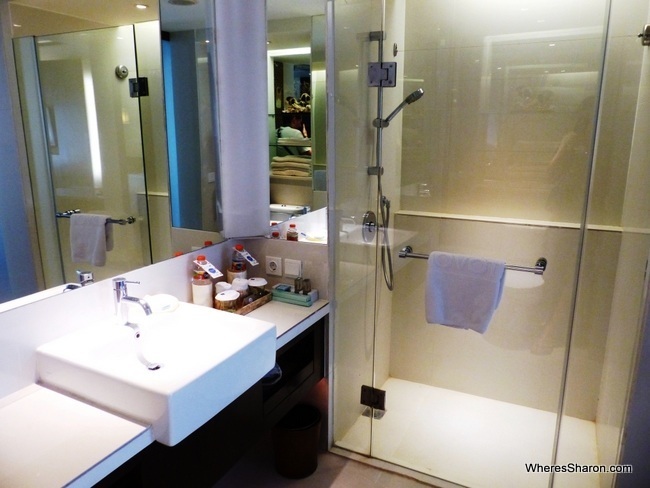 There was cable TV, minibar, good wifi, toiletries and bathrobes and slippers. You can also order room service. Basically it is everything you would expect from a 4 star hotel. The only thing I would have liked was a balcony – I would definitely consider upgrading to a deluxe terrace room next time with a private terrace. 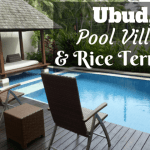 There are also other room types including villas, some with private pools. You can also stay in connecting rooms for families who want more space – it’s 50% off the second room price. The villas also come with lots of extras, like a massage, at no extra cost. 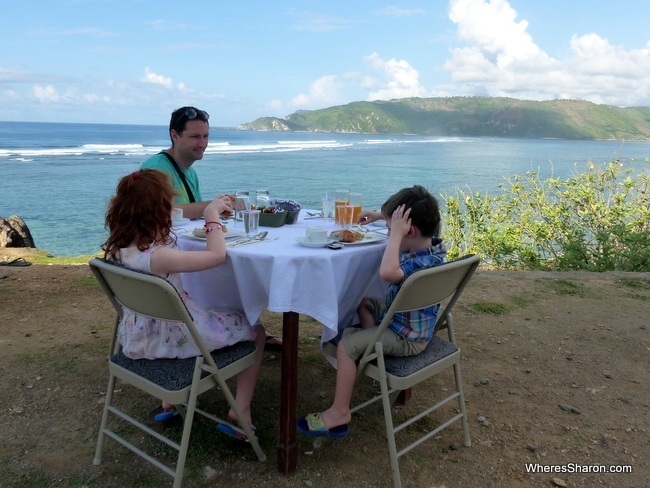 There’s a few different places to eat at the Novotel Lombok Resort and Villas, as well as room service, although the menus do not vary that much. We ate the majority of our meals at the Spice Market which is the main restaurant right by the beach. It has a lovely setting and a varied menu with western and Indonesian options as well as many other Asian choices. Each night, you can also eat at a different themed buffet. The kids absolutely loved the buffet. I found the choices quite limited as my pregnancy has me avoiding salad which made up a fair chunk of them. The bonus with the buffet is that if an adult orders it, then the kids can eat it for free. I did love the a la carte menu. Everything we ordered was fresh and delicious and we were impressed. There is also a great kids’ menu and I was glad to finally see one that had more than fried food options! The kids options are good value but the main menu is quite expensive. Dinner in the Spice Market usually came with evening entertainment which we all enjoyed. For an extra special dining experience, guests can opt to have breakfast on Seger Hill which is next to the resort. There are stunning views and it’s a fun, relaxing experience. We did this on our last morning and it was the perfect way to finish up our visit and I highly recommend it. We had a fabulous stay at the Novotel Lombok. From the moment we arrived, when we were given drinks and the kids were given arm bands, we felt welcome. The resort has a very laid back feel and despite being a peak period (we arrived on New Year’s Day), there was never that many other people around – just enough to give it a nice atmosphere. 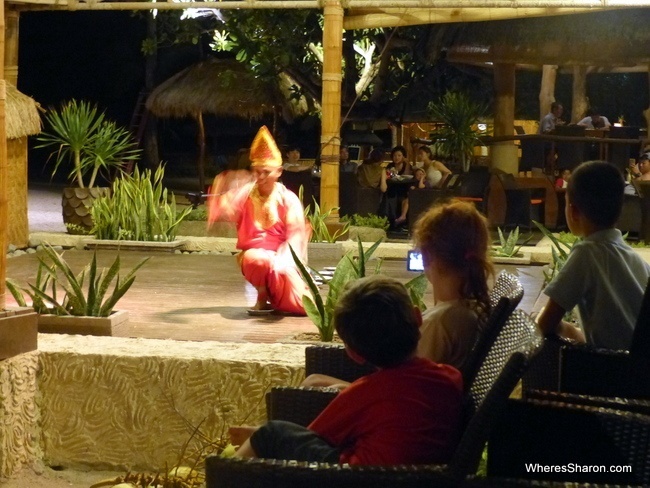 We loved all the included activities in the Novotel Lombok resort. 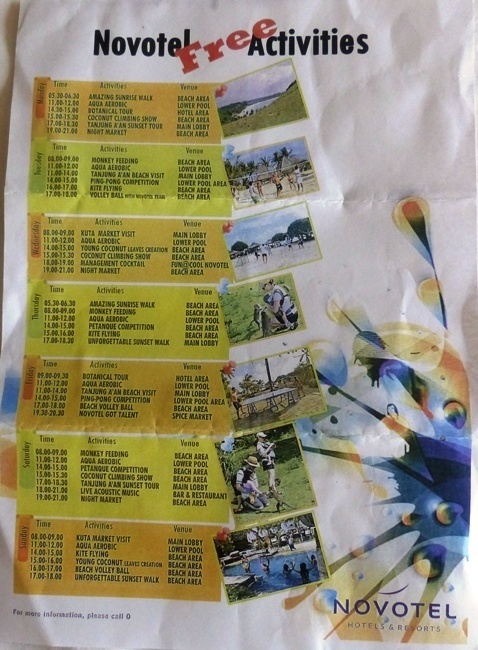 I have never experienced such a varied and interesting activity program in a hotel before especially as quite a few of the activities were off site. The best part was that all the activities ran to plan and kids were very welcome. I have stayed in too many hotels that have activity programs which don’t actually occur. Given the price of the rooms (they started at AUD$135), I found this resort exceptionally good value. My only complaint is that the service was a bit disorganised in the main restaurant. Everything happened eventually but it could be quite haphazard. Once we adapted to this, it was fine. Our kids (3 and 5) loved the resort. They could not get enough of the kids’ club, they loved the live show with dinner – S was so happy that she got to go up on stage and be included, and they enjoyed the kids’ menu and the buffets. 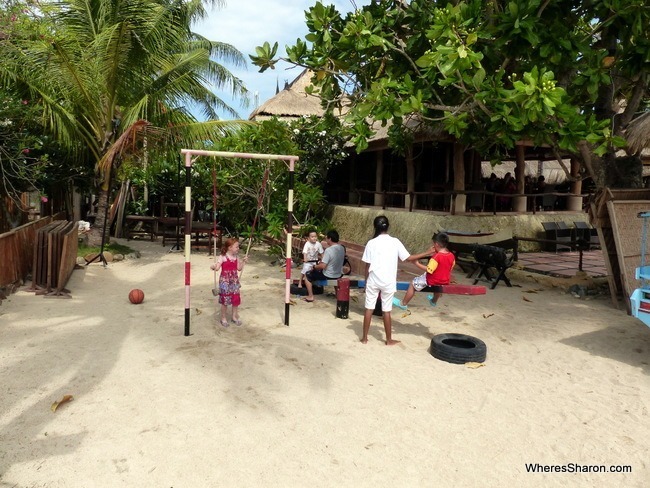 Thanks to the activities and the facilities, I think this resort is great for kids of all ages – there were plenty of families with older kids staying there as well. Thanks to everything being so easy, we were able to do quite a lot during our stay and feel we experienced some more of Lombok while still having a break and some rest and relaxation. Will we go back? Most definitely! 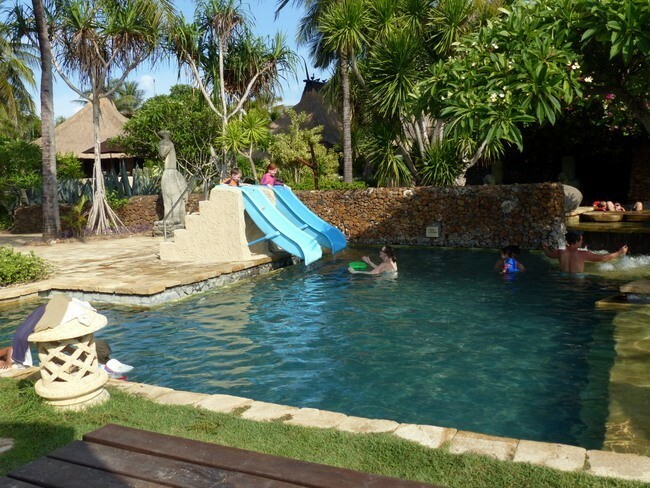 We loved it there, it’s a great price and we really want to see more of Lombok. Read our full guide to Lombok. You can find more information about the Novotel Lombok Resort and Villas on their site. 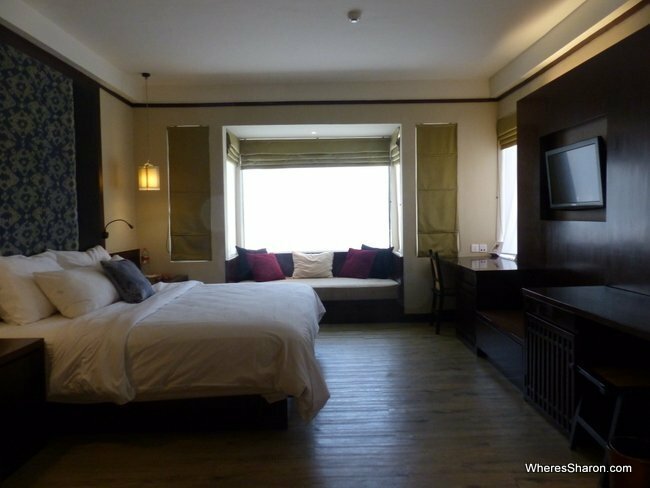 Disclaimer: Our stay at Novotel Kuta Lombok was subsidised in return for writing an honest review on our site. As always, our opinions are our own. This place sounds amazing! My daughter loves buffets haha! I love resorts that keep the kids busy and the parents relaxed! I’ll have to check this place out! Novotel Lombok! One of my favorite places on earth! It was my wedding gift from my parents! Knowing that i have always been excited by places that are not very common and ordinary, Indonesia happened to be my personal paradise! They had booked a super luxury suite with its own balcony, where my husband and I spent most of our evenings watching the sunset and melting in love! There are millions of activities offered in the resort, so if you want, there is no need to search for adventure outside its facilities! We tasted a great buffet with traditional food and tastes, though there where ordinary plates for those who don’t wish to try new things as well! 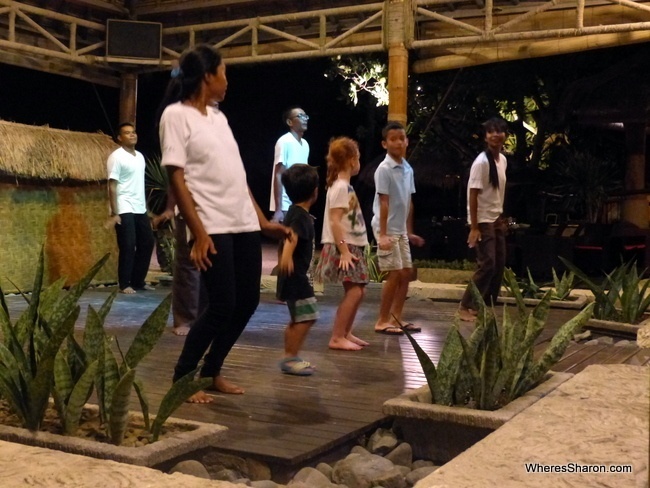 But what impressed me the most is the fact that the resort has many attractions and activities for kids as well, and it seems ideal for families, as the parents can spent some free time alone, while the children are enjoying some shows with animals or traditional dances, or even watching a movie! Great plus for the place is the great massage center-don’t miss it for any reason! It was an amazing experience and…I’m definitely repeating it in the future! Mum, dad…I owe you!